Ah, the Boots 3 for 2 offer - a.k.a my sworn enemy. I always end up having to pick up something. I guess it wasn't all bad since I finally got my hands on the Bourjois Silk Edition Powder (£9.99). I'd been after this powder for months and nowhere seemed to actually stock it on the stands - what a 'mare! Thankfully, they had it online and I managed to pick it up from there. I use the Shade 52 Vanille and so far, it's been a dream to have in my makeup collection. 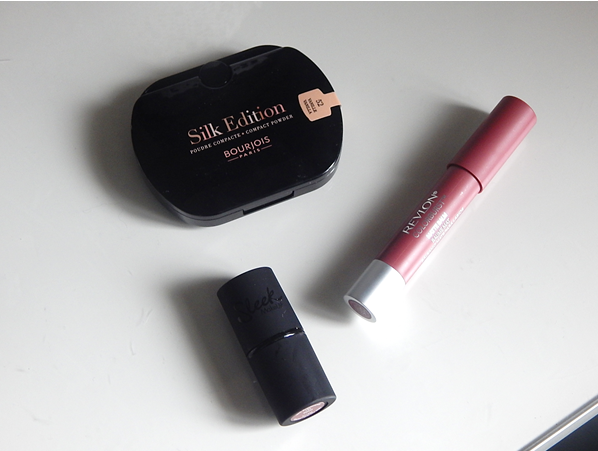 Secondly, I added another much sought-after item to my basket (and again, one that I couldn't seem to find in any of my local stores) and that's the Revlon Matte Balm in Sultry (£7.99). I fell in love with this colour when I saw it on a friend and from that moment on I had to have it - but I could never get my hands on it. It's a love dusky, Kylie Jenner-esque mauve. For my third, final and free thing I thought I'd make use of Sleek. I love Sleek but never really shop their stand much, mostly because it's always surrounded by people or they have nothing on the actual counter - annoying. Their True Colour Lipstick in Dare (£4.99) is stunning. I love the dark, reddish colour and it lasts for ages. I may just have to pick up more from the range. Great picks, I'm trying to stay as far away from Boots as I can as I did so much damage in the last 3 for 2, it's a deadly offer ;-). We don't have any sort of deal like that in Canada, so I always take advantage of the 3 for 2 when I'm in the UK! I LOVE it! Everything you picked up looks really lovely, and the Bourjois powder sounds just fab! Great choice! What do you think of Bourjois Silk Edition Powder is it two powdery on the skin and visible on the sun?